In the 2012 MLB season, it was no secret that the Royals struggled for yet another year. With a new advertising bid in place, stating that “this is our time”, fans became overly ecstatic about the start of the season. As it turns out, the Royals laid an egg. They had a twelve game losing streak early on and were never quite able to recover from the damage. The tail end of the 2011 season had everyone talking about the Royals in 2012. With young guns getting comfortable in the majors, such as Mike Moustakas and slugger Eric Hosmer, plus the so-called “veterans” hitting their stride, like Alex Gordon and Jeff Francoeur, the Royals were really supposed to be a force to be reckoned with in the A.L. Central. But the performance given in 2012 was one that nobody could have expected. After Eric Hosmer’s spectacular finish to his rookie season, one could only feel the confidence and momentum he brought to the organization. However, he ended up hitting rock bottom, somehow falling into the traditional sophomore slump. Eric’s impressive stats in 2011 included a batting average of .293, an on base percentage of .334, and a slugging percentage of .465. He fell extremely short of everyone’s projections in his next season as a Royals. 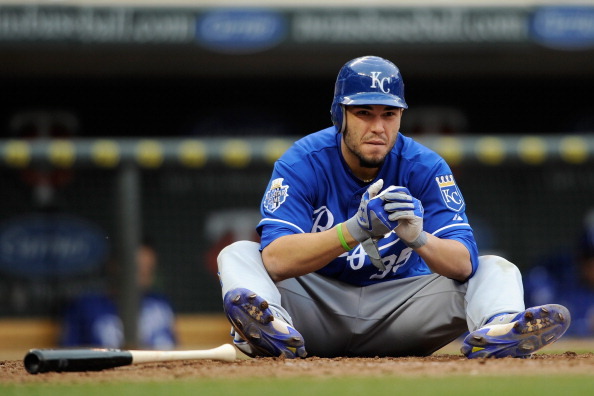 On May 7, 2012, Hosmer was only hitting .185, and his on base percentage dropped to .261; as well as his slugging percentage dropping almost one hundred points, down to .370. Despite his jump in walks from about 6% to 9.2%, his on base percentage still took that dreadful dip. Also, in just 128 games in 2011, Eric raked in 153 hits, including 19 home runs. In a full season in 2012, playing in 152 games, he had just 124 hits with just 14 homers. Seeing these stats, it was no surprise that Hosmer’s decline was one of the main reasons that caused the Royals offensive production to fall short of the preseason expectations. The Kansas City Royals have many offensive weapons in place, but it always seems that they can’t hit their strides at the same time. With the most consistent hitters in Billy Butler and Alcides Escobar, the rest of the group will need to pick it up if they want to surprise some people in 2013. With consistent defensive play in both the infield and the outfield, the Royals are just missing consistent hitting and pitching. As of now, some may say the Royals have a chance in 2013, but we won’t see any changes unless they find a way to become more consistent. So was Hosmer’s season just a fluke, or do Kansas City fans really have something to worry about? Everybody knows that Eric is an excellent fielder, but nobody expected he would take such a decline in hitting. There have been rumors about Hosmer on the trading block, simply because the organization feels they could do without him, in order to find another quality pitcher to put in the rotation. As of now, Hosmer is safe in Kansas City, but if fans want him to stay with the Royals for a long and successful career, Eric Hosmer will need to pick it up in 2013, proving that he still has the talent he showed in his rookie season. This entry was posted in Baseball, Baseball, Home, Midwest, National.